Over his career as a carpenter, Matt Kasvinsky has built a wide assortment of things from wood: kitchen counters, barns, decks, pergolas, cabins on stilts, even coffee tables in the shape of Vermont. His latest undertaking? Building custom-made caskets. Compared with the rest of his work, casket making doesn't pose technical challenges, Kasvinsky readily admitted: Each one is basically just a six-sided rectangular plywood box, albeit a well-constructed one. 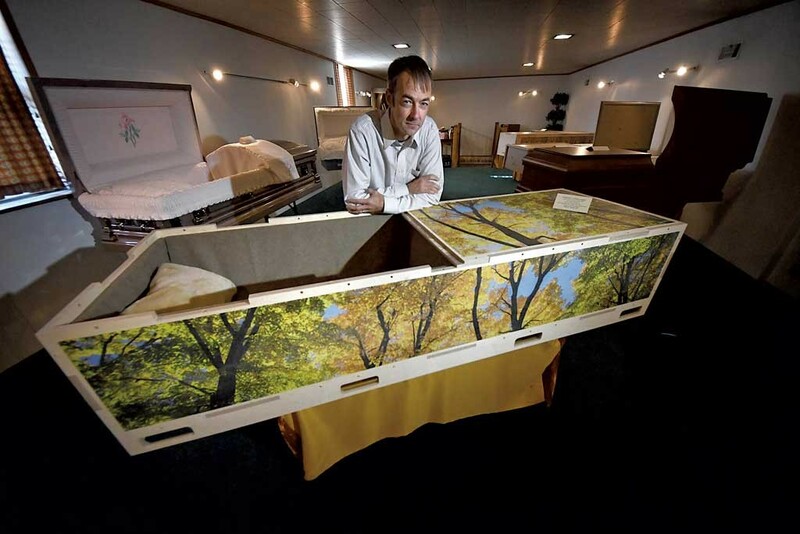 But the Duxbury carpenter hopes that grieving families will find his unique "modern Shaker" caskets, with Vermont scenes printed on the outside, more meaningful and personal than the mass-produced, run-of-the-mill options. And the desire to create them emerged from his own experiences as an all-too-frequent mourner. The 49-year-old Acton, Mass., native spent many years in Fairbanks, Alaska, before moving to Vermont in 2005. In those far northern climes, he said, several of his friends died prematurely from accidents, disease or hard living. As he put it, "Alaska tends to eat people up." Attending all those funerals, Kasvinsky recalled, he was struck by their generic and impersonal nature. While the eulogies were always heartfelt, he said, nothing else about the burial ritual seemed to reflect the lives of the people who were being memorialized. "Look at a traditional casket. It doesn't make me think of anything but death," Kasvinsky said. "I was thinking, How can you make it so that it represents the person inside?" So Kasvinsky began researching ways to build caskets that were "more like a canvas" — that is, imprintable with photographic images, drawings or other designs that reflected the lives, interests and characters of the deceased. The result was Vermont Custom Casket, founded in 2013, which offers simple, creative coffins with the motto "Celebrate a unique life." Reflecting the prevalent ethos of the Green Mountains, Kasvinsky uses only eco-friendly, sustainably harvested and biodegradable construction materials. That's more than a local selling point; sustainability is an increasingly pressing issue in the funeral industry. Though most Americans prefer not to think about what will go in the ground, or up in flames, with their bodies once they've died, death has a shockingly large ecological footprint. According to a 2012 article by Alexandra Harker in the Berkeley Planning Journal called "Landscapes of the Dead: An Argument for Conservation Burial," Americans bury approximately 30 million board feet of lumber annually, much of it exotic and unsustainably harvested hardwood. Each year, Americans also place in the ground 2,700 tons of copper and bronze, 104,000 tons of steel, 1.6 million tons of reinforced concrete, and 827,000 gallons of embalming fluid, most of which is composed of carcinogenic formaldehyde. Cremations now account for about half of all dispositions of the dead in the U.S., including 70 percent of those in Vermont. While they may present a less resource-intensive option than a conventional burial, they have their own significant environmental impact: Each cremation consumes about as much fuel as a 500-mile SUV trip. Collectively, cremations release about 250,000 tons of CO2 into the environment annually, along with other pollutants such as mercury. "I hope the next generation will see that [cremation] is not what we should be doing," Kasvinsky said. "From a soil-building standpoint, it's better to have bodies in the soil." How to encourage Vermonters to bury their dead more sustainably and creatively? About five years ago, Kasvinsky approached his friend Kirk Williams with an idea. Williams was a Burlington artist and metal worker known for having designed several public artworks in the Queen City, including the fish fountains on Church Street, the waterfront skate park and the huge red sundial near Community Health Centers of Burlington in the Old North End. "Without Kirk," Kasvinsky emphasized, "the idea wouldn't have gotten off the ground." Early on, Williams introduced Kasvinsky to Burlington architectural designer and illustrator Lincoln Brown, who drew up the CAD drawings for the caskets' wood sections. All the plywood Kasvinsky buys is green certified and sustainably harvested in the United States and contains soy-based glue and no formaldehyde. (His goal is to get the caskets certified by the U.S. Green Burial Council.) Kasvinsky said he chose plywood both for its sturdiness and for its consistent veneer, on which digital images can be printed. To add that printing piece, Williams introduced Kasvinsky to Martin Feldman, president of Light-Works of Winooski, which does large-format digital printing for clients such as Ben & Jerry's Scoop Shops, Lake Champlain Chocolates and the Vermont welcome centers. Light-Works takes Kasvinsky's milled plywood sections and prints digital images on them using nontoxic, soy-based inks. Initially, Kasvinsky used stock images he'd purchased online. Later, he reached out to friends and photographers Brian Mohr and Emily Johnson, of EmberPhoto in Moretown, to ask if he could purchase the rights to some of their Vermont photographs. "It was an unusual request. I can't say we'd ever licensed imagery to a casket maker before," Mohr recalled with a chuckle. Still, the couple was more than happy to work with Kasvinsky, and not just because he was an old friend. "I think there is a fear of death in our society and a general hesitancy to embrace what dying really is, which is a big step in our lives into the unknown," said Mohr. The couple has licensed Vermont Custom Casket a half dozen Vermont images, including fall foliage and winter mountain scenes. After the plywood casket sections have been milled and printed, Kasvinsky begins the daylong process of assembling each casket by hand. He eschews metal nails and screws, opting instead to join all the sections using wooden pegs. He lines the casket's interior with excelsior wood shavings, also known as "wood wool," a beige, biodegradable product also used by highway departments to stabilize and reseed roadway embankments. The excelsior padding is then covered with an all-natural wool fabric that Kasvinsky buys from Johnson Woolen Mills. Unlike conventional caskets, Kasvinsky's products are flat on top and hence easily stackable. They can also be sold unassembled, so that they can be flat-packed, shipped nationwide or put in storage until they're needed. For a time, Kasvinsky even considered marketing his brand as "the IKEA of caskets" — until he learned that the Swedish retailer had beaten him to the idea. In January, IKEA founder Ingvar Kamprad was buried in one of the company's customer-assembled coffins. But Kasvinsky recently won an award for his design. North Carolina-based Columbia Forest Products gave Vermont Custom Casket the top 2018 PureBond Quality Award in the commercial category for its unique burial casket concept, according to a press release. Columbia Forest supplies hardwood plywood products throughout North America. Vermont Custom Casket sells its products through the Perkins-Parker Funeral Home in Waterbury, which currently has two on display; Kasvinsky doesn't want to compete with local funeral directors by selling directly to consumers, he said. When Perkins-Parker sells one, he simply builds another. "It's not like I have a warehouse full of them," he joked. Indeed, the business has grown slowly so far, Kasvinsky admitted. Still, he sees a market for his caskets growing throughout New England, where many people put a premium on locally and sustainably produced products that are also unique creations. Currently, Vermont Custom Casket offers six different standard options. But Kasvinsky can print "practically anything" on a casket, he said, provided he has advance notice of about two weeks and a high-resolution digital file. As the business grows, he envisions partnering with Vermont visual artists to offer more decorative options. How do Kasvinsky's wife, Heather, and their two kids feel about his work? "She's an artist, so she's totally into it," he said of his wife. As for the kids, who are 8 and 5, "They're totally OK, too. They know that dead people go in them," Kasvinsky added. "Not that I let them climb inside or anything, [but] I don't think they're fazed by them." Kasvinsky acknowledged that his caskets, which retail for $2,600 each, may not fit every Vermonter's budget. Still, that's a comparable price tag to mass-produced caskets for, in his opinion, a better-built product. The story of Vermont Custom Casket has a sad footnote: Williams, who helped get the business off the ground, never saw it come to fruition. He contracted a severe and unexpected illness in December 2015 and died on January 4, 2016, at the age of 53. Soon thereafter, Kasvinsky laid out his friend in the first casket they'd created together, then covered him with a blanket and sealed it for cremation. "As the observer of the dead and the dying, we have no control over the situation. What gives us control is being able to celebrate that person's life and cherish who they were," Kasvinsky said. "If there's something that I can do to make it easier for people, it seems to me like a noble thing to be doing." Correction, October 29, 2018: An earlier version of this story misidentified the Alaskan city Kasvinsky used to live in. It was Fairbanks. The original print version of this article was headlined "Outside the Box"
WTF: Why Can't Vermonters Be Composted When They Die? In this episode, a ghost hunter talks about the consumption habits of the dead, health care purgatory and the most horrifying thing he's witnessed on a hunt. Does the Ultra-efficient Passive House Point the Way to Carbon Neutrality?